Paddy Patterson celebrates his try with Ross Byrne. 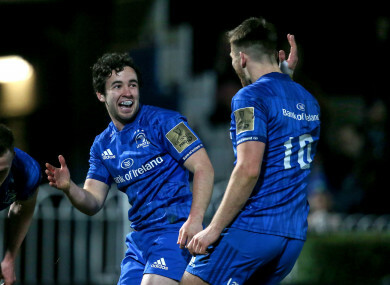 DESPITE THE CONTINUED absence of their international stars, Leinster will move into this week’s home encounter against the Cheetahs with a 22-point lead at the top of the PRO14 Conference B table. The defending champions briefly pulled 27 clear as a result of their facile 59-19 victory over Southern Kings on Friday, before subsequent bonus-point triumphs for Benetton and Ulster pegged them back ever so slightly. While acknowledging the healthy position they currently find themselves in, Leinster head coach Leo Cullen stressed it is no guarantee of future success. “There’s different merits for the Conference or if it was one big ladder, it wouldn’t look as obvious as that. It’s 11 points with Munster on the other side. It depends what way you want to look at it. As I said, for us we’re not getting too concerned or bogged down by that,” Cullen explained after Friday’s game. “There’s no prizes for winning your Conference. As we know ourselves, we finished top of the old PRO12 ladder and didn’t take away the trophy at the end of the season. When their clash with the Kings was still in the melting pot – the South Africans led 12-7 on the first-quarter mark – it was one of Cullen’s fringe players who stepped up to the plate. Lining up alongside debutant Ronan Kelleher and Andrew Porter in the front-row, Ed Byrne bagged tries in the 24th and 28th minutes to get the hosts back on track. Even though there is a ferocious competition for places at loosehead prop, the Carlow native’s man of the match display will provide Cullen with food for thought. “It was an all-action display from him [Byrne]. He got in obviously for his two tries. Took him off before he got his hat-trick! It’s a very competitive position loosehead, all the guys are working hard. In addition to the province’s Six Nations contingent, Cullen is also having to contend with a host of injury problems. Devin Toner and Will Connors are a long way off a return to full fitness, but the picture is becoming clearer for the rest of the walking wounded. Email “'No prizes for winning your Conference:' Cullen won't let Leinster rest on 22-point cushion”. Feedback on “'No prizes for winning your Conference:' Cullen won't let Leinster rest on 22-point cushion”.